Though nycthohemeral variation in the plasma concentration of human thyrotropin (TSH) initially proved difficult to demonstrate (1–6), its occurrence now appears to be fairly well established (7–14). However, an unusual degree of variation in the clocktime of occurrence of these daily maxima across the night exists in these reports in which peaks were found in the 2100–0000 hr (10, 11, 14); 0000–0400 hr (7, 8, 10); or 0300–0700 (9, 12, 13) intervals. In earlier work (15), we presented evidence confirming the existence of nychtohemeral variation in plasma TSH concentrations, and showed that it was rhythmically repetitive over several nights. Our results further indicated that nycthohemeral maxima most consistently occurred prior to the onset of sleep in the 2100–0100 hr interval across usual normal sleep-wake cycles that were well maintained. We could find no convincing evidence in support of any sleep-related enhancement in TSH release (8–10, 14). 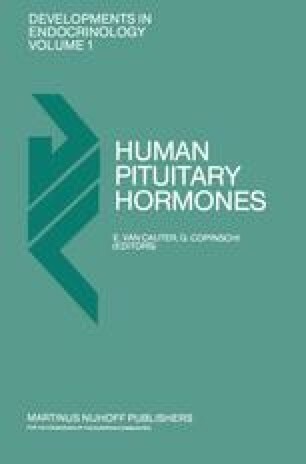 Instead, a unique occurrence amongst nightly patterns of human anterior pituitary hormones was seen in which diminished TSH release characterized the course of undisrupted sleep of normally maintained sleep-wake cycles. Shifts in the time of entering polygraphic sleep were associated with alteration in the concentration and timing of resultant TSH maxima in a way that suggested the presence of an inhibitory influence in sleep upon a circadian mechanism for TSH release.